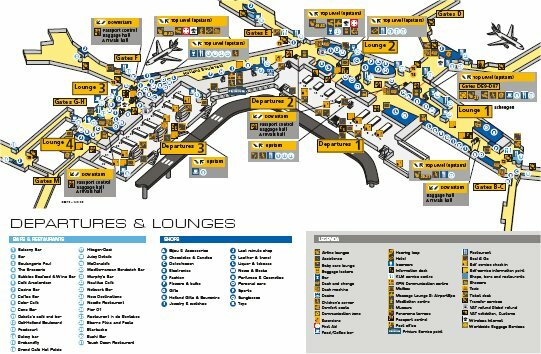 Download a free Schiphol Airport Map on this page, listing all the departure and arrival halls, piers, shops, parking and other facilities at Amsterdam Airport Schiphol. 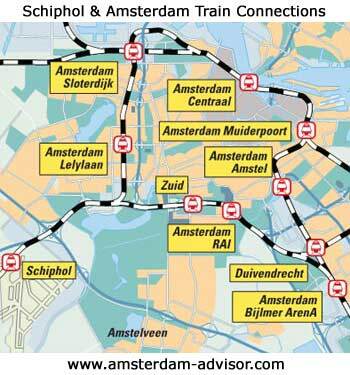 Scroll down to see a road and train map of the Amsterdam & Schiphol area, showing you how to reach the airport from the Amsterdam city center. 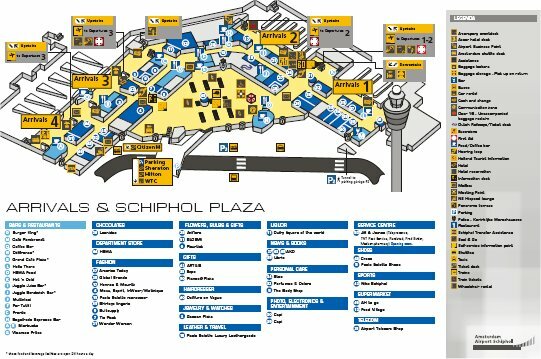 Download the Schiphol Airport Map by clicking this link, or the image below (3.2 MB). Orientation at Amsterdam Airport Schiphol is rather easy. There are two floors. 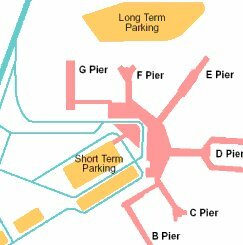 If you arrive by train, taxi , car or bus, you will first be led into Schiphol Plaza which is the main airport hall (the first image above). At Schiphol Plaza, you can find shops, eateries, service centers with phone/internet/mail services, and other such facilities that are accesible to anyone. Right behind Schiphol Plaza are the four Arrivals halls. Find them all in the Schiphol airport map linked above. The second floor (the second image above) has the three Departure halls, passport control and the lounges. Most shops, eateries and facilities here are behind passport control, so only available to those who are going to fly. 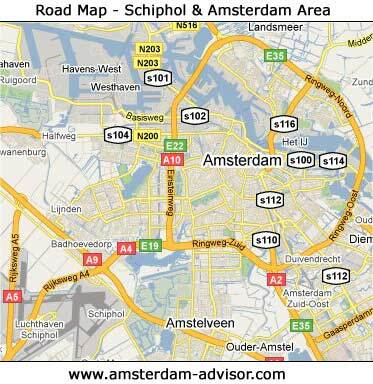 For a longer list of facilities, please see our Amsterdam International Airport page. 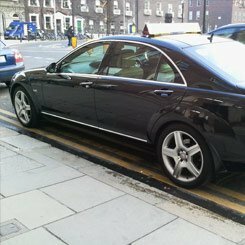 Our Amsterdam airport transfers page shows you how to quickly get from Schiphol to the Amsterdam city center. Here's a map of the train connections in the Schiphol and Amsterdam area. Trains arrive and depart right below Schiphol Plaza. 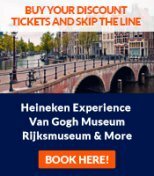 Trains are fast and cheap, and since there are often traffic jams around Amsterdam, taking the train is your best chance not to miss your flight. That's why we always take the train between the airport and the city center. Take notice: not all trains from Schiphol in the direction of Amsterdam will stop at Amsterdam Central Station, so make sure you have the right one. Make sure you buy a ticket in advance from the yellow-blue vending machines or the ticket office, since buying a ticket inside the train means adding a 35 fine to the fare. From Schiphol to the Amsterdam city center takes around 25-30 minutes, if there aren't any traffic jams. However, if you're going to stay in the Amsterdam city center (especially in the Canals area), a car isn't very convenient: it's slow and there's only limited and very expensive parking space. In this case, you'll be better off by taking trams or renting a bike. Amsterdam is small so biking is often the quickest. On the other hand, if you're staying a few miles from the city center (in Amsterdam West, Zuidoost, Noord etc.) you can move around by car fairly quickly and parking is usually available, and much cheaper or free.